Harness the power of over twenty years of award-winning multimedia development for your next interactive CD, DVD or Internet project. 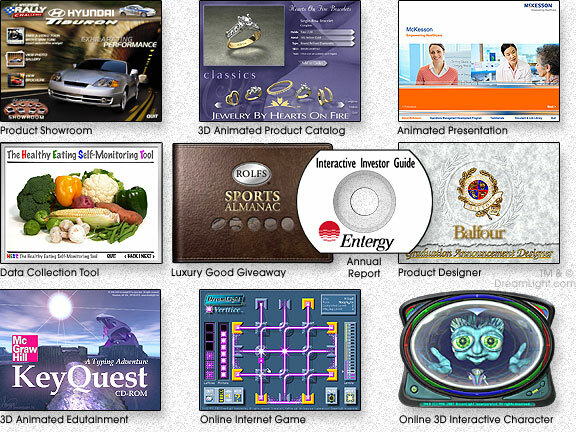 DreamLight® Catagent is our interactive catalog engine that is the culmination of over twenty years of award-winning interactive multimedia work on a variety of projects from interactive brochures, through interactive product catalogs, to full length edutainment CD-ROM development. With each new project we’ve extended and enhanced our Catagent interactive engine. Adding new modules for a variety of sophisticated features. This enables us to build new interactive catalogs and multimedia projects much more quickly and cost effectively, avoiding the high cost of developing your project completely from scratch. DreamLight can quickly build your project with our Catagent technology and simply license the specific components desired. Additional features and modules can be custom built upon request. Our DreamLight Catagent technology is designed and programmed using our own in-house DreamObjects object-oriented foundation classes for Adobe Director and Flash. If youd like DreamLight to create a Catagent interactive project for you, please contact us. As expert Macromedia Authorized Developers, DreamLight publishes the DreamLight Director Talisman , a popular on-line resource where other Macromedia Director developers learn from DreamLights many tips & tricks. DreamLight also publishes advanced developer utilities, such as DreamLight RAMLight and DreamLight NetLab .